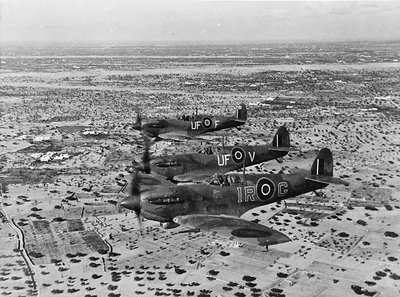 W/Cdr Ian Gleed, C/O of 244 Wing RAF in the Western Desert, flies in formation with a pair of Spitfires of No. 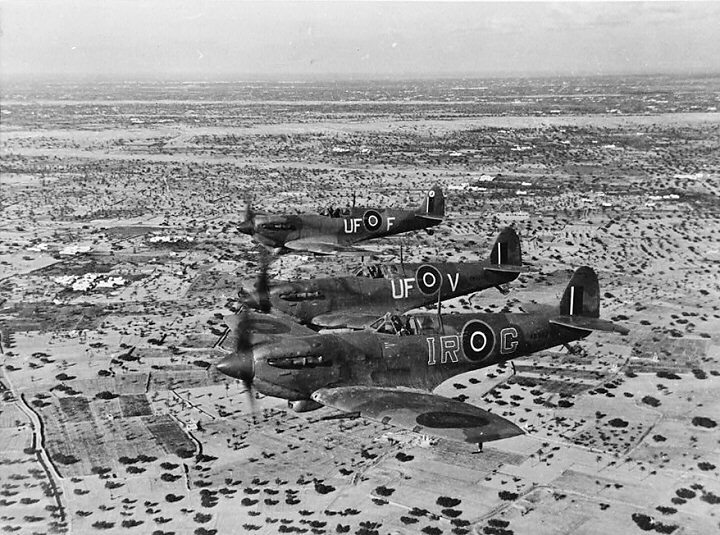 601 Squadron over De Djerba Island, off Gabes, on their way to the Mareth Line area, around April 1943. Note that all three fighters are equipped with low-drag Aboukir filters. W/Cdr Gleed received a posting to the Middle East in January 1943 becoming the Wing Leader of No. 244 Wing. He selected Spitfire Vb AB502 as his personal aircraft, ordering his initials IR-G to be painted on the fuselage introducing this practice, already established in Britain, in the Mediterranean theatre.